Today, New Era Cap Co., Inc., the authentic cap of the National Basketball Association (NBA), announces the New Era NBA Authentics: NBA All-Star Series, a special headwear collection designed for this year’s game in Charlotte, North Carolina. This year’s New Era NBA Authentics: All-Star Series features unique designs with a mix of silhouettes including 59FIFTY, 9FIFTY and 9TWENTY. Each cap features a unique design utilizing the Charlotte Hornets’ color palate, teal, white and purple as well as the honeycomb pattern displayed on the Hornets’ court. 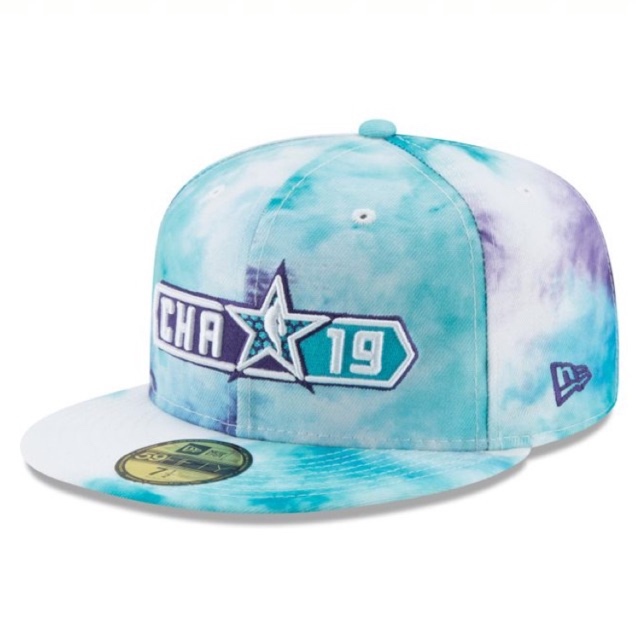 New Era NBA Authentics: NBA All-Star Tie Dye: Adding an element of style to the collection, this teal, white and purple tie dye graphic print cap features the primary Charlotte NBA All-Star 2019 logo embroidered on the crown. Available in a 9FIFTY, the cap also comes in a black and white colorway with a 59FIFTY version available exclusively here. New Era NBA Authentics: NBA All-Star Pri Star: Available in a 9FIFTY and 9TWENTY, this cap features the Charlotte NBA All-Star logo man on the crown and an oversized NBA All-Star 2019 wordmark embroidered on the side. This cap is available in a black and white colorway with a 59FIFTY version available exclusively here. New Era NBA Authentics: NBA All-Star Oversized Star: Show your excitement for the 2019 NBA All-Star Game with this 9FIFTY cap featuring an embroidered oversized Charlotte NBA All-Star logo man on the crown and a second NBA All-Star logo man on the rear. Additionally, this cap has a honeycomb pattern on the visor and snapback enclosure. A 59FIFTY version is available exclusively here. New Era NBA Authentics: NBA All-Star Suede: Available in a 9FIFTY and 9TWENTY, this stylish black monochromatic cap combines faux suede with a Charlotte 2019 tonal wordmark embroidered on the crown. The New Era NBA Authentics: NBA All-Star Series is available here as well as select headwear retailers with retail prices of $28-$38 USD. New Era Cap Co., Inc. is an international lifestyle brand with an authentic sports heritage that dates back over 90 years. Best known for being the official on-field cap for Major League Baseball and the National Football League, New Era Cap is the brand of choice not only for its headwear collection, but also for its accessories and apparel lines for men, women and youth. The brand is worn as a symbol of self-expression by athletes, artists and some of the most interesting people around the globe. New Era Cap encourages people to truly express their personal style and individuality through its products. The Company is headquartered in Buffalo, NY and operates facilities in Canada, Europe, Brazil, Japan, and Hong Kong. For more information, visit our website. This entry was posted in Feature and tagged 360, 360 Magazine, 59FIFTY, 9FIFTY, 9TWENTY, arena sports, Basketball, brazil, Buffalo, Canada, Charlotte, design, europe, hats, Hong Kong, hornets, Japan, john connors, MLB, NBA, nba all-star series, new cap era, new era nba authentics, New York, NFL, North america, north carolina, oversized star, pri star, snapback, sports, Suede, Tara McDonough, tie dye, Vaughn Lowery on February 7, 2019 by wp360mag.